There’s a pretty unique blog out there put together by a few renegade running ladies called the Bad Angels. The authors regularly contribute to the site with their own thoughts on running, training and racing, accumulated through years of hitting the pavement. This wisdom is packaged in neat little “rules,” which range from conventional advice (rule #91 – Drink Water) to personal quirks for newcomers (rookie rule #11 – Get Inked). In addition to these guidelines, they also provide race recaps, tons of running song recommendations and the occasional op-ed on the goings-on of the running community. It’s a funny blog because running is seen as a simple concept. You put one foot in front of the other, then you go fast enough to be airborne and that’s it. You’re running. You’re falling forward but catching yourself. Simple enough, right? That is, until you go hard. It’s not until you dip your toe into the local racing community, until you sign up for a long-distance race and become completely inundated by everyone’s opinions on shoes, gear, race fees, efficient gaits, the legitimacy of Dean Karnazes and whether giving medals at 5ks diminishes the value of accomplishment that you realize how insane the sport is. The point is, when you become a Runner with a capital R, things stop being so simple. There are so many things to consider, which is why it’s helpful to have a blog that has 105 rules (and counting) for your reference. Many races these days are luring runners by email blasting their medal design before the event even happens. While I have said on numerous occasions and make no attempts at hiding it, an awesome medal will get me to your race. In my list of motivations, “zomg a medal with a duck on it” ranks much, much higher than “this would improve my overall health” and “finishing would bring great honor to my ancestors.” But for some reason, I don’t want to see it before I actually earn it. In other words, it’s totally okay – in fact, it’s necessary – to see medals from previous years so you get an idea of what to expect this time around. However, if they post it on their website or email it to you or carry it in a golden sarcophagus to a mountain in the desert, don’t look at it, Indy! You’ll enjoy it so much more when it’s a surprise at the finish line and all the Nazis are dead. You don’t want to miss out on your corral start because you got in a 30-minute bathroom line 20 minutes before the race start; you don’t want to end up in the Z Corral because you ended up parking two miles away after everyone else took all the choice spots; and you certainly don’t want to spend the first two miles side-stepping charity walkers because you thought waking up at 4 AM wouldn’t be awesome sauce. Trust me, show up early. Every race is full of people who don’t obey the pace rules. You line up next to the 7:30-pace sign and sure enough, there will be people running 9- or 10-minute miles next to you for the first mile. There’s no panacea for this, it’s just an annoying reality that we have to face no matter how fast we run. And let’s face it, lots of people running a 7:30 pace probably lined up with the 6-minute milers just because it feels badass to be near the start. However, we can be part of the solution. So what I recommend is picking a Corral or a pace sign just slightly slower than your goal pace, but when the gun goes off, run at your intended pace. Better to be faster than the runners around you (and annoy the scrub n00bs you pass) than be slower (and annoy everyone else). We all love to PR. It feels great, it validates our efforts and we get to brag about it for a few days when people are dumb enough to ask. However, unless you’re just starting out, you won’t PR every time. In fact, the more you run, the less likely you’ll achieve a personal best as you become more of a Nordic god see your returns diminish. While I consider myself an optimist, I put more stock in pragmatism than blind enthusiasm. After all, your brain secretes more happy juice if you surpass your C-level times versus missing your A-level times, right? I’m no brain surgeon, but I think I read that on the internet somewhere. So when I line up to start, I sandbag my time goals. Even if I’m feeling 100% with spring-loaded shoes and a hired thug with a nailbat ready to chase me, I’ll tell myself, “You know, I’d be happy if I finish in [SUPER FAST TIME minus several minutes].” This doesn’t mean that I’ll run any less hard or put less effort into it. I’ll still try my damndest to PR. But if I don’t, it’s alright. I’ll move on and sleep soundly that night with help from the Sandman. And his bags. Of sand. I’m sure there was a better way to end this one. Just don’t, you’ll embarrass yourself. To date, I have yet to finish anything longer than an 8k without walking at an aid station. I’m not a big fan of pouring Gatorade down my shirt or into my nose, so I like to stop, walk, and make sure I do it right. However, there are thousands of people behind me who might also want to do the same thing, which would turn the rushing parade of humanity into the foreigners-only line at LaGuardia (but without all the scared silence). So to keep this from happening, I take my cup and keep running until the aid station ends. At that point, I duck to the outside of the course, the “slow lane” if you will, and hydrate leisurely while Vivaldi plays in my head. Unfortunately, that’s not a Total Recall reference. Instead, it refers to the phenomenon that occurs when giant charity groups (you know who you are) decide to run four, five even twelve people across, making it awkward or impossible to pass them without sounding like a jackass. Look, I get it, there’s a huge feeling of camaraderie involved in running with your charitable organization. It’s not just you running, but your support network. But not every race is the Chicago Marathon, where you have four lanes of space on either side. Most races run on residential roads or bike paths and half-mooning around your altruistic posse isn’t easy. So if I ever find myself running as part of a horizontal line of people, I either pull ahead or duck behind them to let other runners through. Remember, these rules aren’t for everyone. Every race finish, no matter how fast or how long, is an achievement, an improvement over sitting at home watching redneck hoarders auction off storage containers full of real housewives (or whatever the kids are watching these days). I will never tell anyone to not openly celebrate a race finish, nor do I look down on anyone for being proud of finishing a race. But my personal rule is that I don’t throw my arms over my head, air guitar “Sweet Child of Mine” or do the Dougie at the finish line unless I PR. That’s just my rule. All efforts shy of BEST EVAR earn a quiet, internal celebration. Volunteers are awesome. They could have stayed home and made sweaters for their pugs but instead came out to hand paper cups to oily, snotty hands. Or they’re out at intersections, holding their arms up to stop or direct traffic until their muscles atrophy. Some are at the gear check tent, doing their best to find your bag, which looks exactly like the other 400 bags out there because the race organizers demand that you use their standard issue gear bags (which I will never understand). Others are at food tents, watching as sweat-streaked runners touch three bagels before deciding what they really want is an orange and wondering why there aren’t any Purell stations on the course. Or they’re at the finish line waiting for Galactus to get that picture of me he wanted before asking for his autograph watching people come close to voiding their bowels. And so there you have it, my short set of rules for race etiquette. By no means exhaustive, I think it covers most of the basic guidelines. I’m sure if I sat down and really thought about it, I could make a longer list, but I’ve already stomped on the Bad Angels’ turf too much, so I’ll leave it at this. For more rules, please visit the Rules for Running page and subscribe to them (especially if you’re from Chicago – they give the city lots of love). You mean my job isn’t to look pretty at the finish line?! (Obvious sarcasm as I am well aware of how revolting my appearance is after even a 5k, unless semi-conscious, drooling chicks are your bag). I nodded my head particularly aggressivly whilst reading rules: 1,2,3,6 and 7, but I will continue to streak half my face and chest asI fail to inhale an entire gel during a half marathon. That counts as long enough to warrant something. Oh my god, and there should obviously be a space between ‘as’ and ‘I’. Extra points for the Total Recall reference (made me LOL), but I must admit that I do gel during half marathons, which is less than 25K. Please don’t judge me 🙂 I just need a shot around the 10k mark cuz the Gatorade doesn’t have the CAFFEEEEEEEEIIIIIIIIIIIIIINE I need around then. 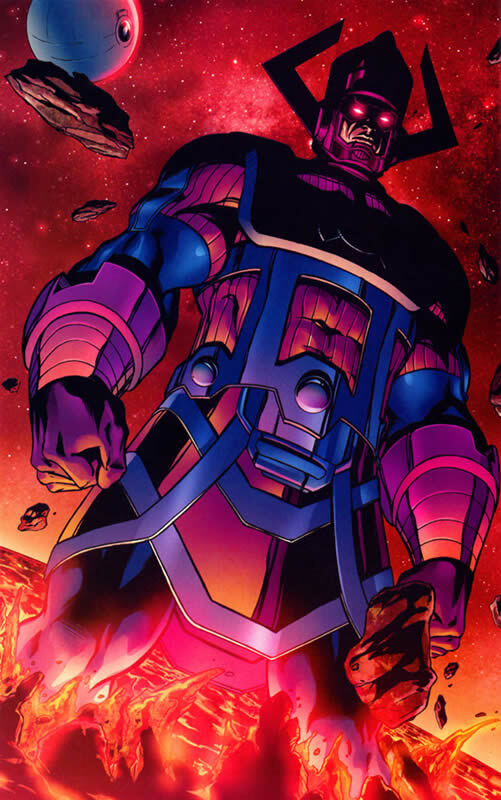 Galactus? I’d vote for you over a proven world-devourer any day. The Watcher may actually give you more of a run for your money with that big brain o’ his. Well-conceived list. Rule 10 should probably be rule 1, since volunteers they make the runnin’ world go ’round. In theory, I agree with rules 2 and 3 but regularly screw them up in practice. Typically I start with faster runners so I can get off to my own fast start (i.e. I start at their pace), then once things open up I fall back into my own discomfort zone. And I have yet to wake up any earlier than necessary for a race… my brain never seems to buy into that “you’ve spent so much time training, you might as well spend a few extra minutes to ensure you’re on time” nonsense. It would rather sleep another 15 minutes. I think that’s a result of running mostly laid-back trail races with smaller fields and exactly zero charity runners. Bling-wise you’re dead-on with rule 1, I don’t understand the need for race directors to show their hand before race day… tease us, tantalize us, as runners we’re easy targets for mind games. And for your bonus rule: unless you just finished your first marathon I’d actually limit the medal-wearing to the finish area. As soon as you leave the immediate race zone with that medal around your neck you might as well be dressed as Ben Franklin, and onlookers will feel more sorry than happy for you. While the embarrassment may not faze you, try to think of the rest of us runners you’re representing. And if you wanted to slide in another Total Recall reference or two, I might recommend that people start training more than “two weeks!” before the race for best results…. and don’t cross that finish line without looking like Kuato. Aha!! I love all of them, but number 8 cracked me up. I definitely felt like death at the end of my marathon on Saturday! I can only imagine the gruesome pain face I was making!! After reading these, I’m not sure how you read my blog because I violate pretty much all of them every time I run, except for #10. I am an exceptional volunteer thanker. Just goes to show you how cool you are — I read your stories despite my EXTREME PREJUDICE. I jest, I jest. These are just things I do – the majority of them don’t bug me if people do them differently. I giggled, then outright guffawed at the accompanying description for Rule #1. I, too, crave a medal with a duck on it, and I am also an unabashed fan of Raiders Of The Lost Ark. As for Rule #4, you’re the biggest sandbagging sonuvabitch I’ve ever met, so I’m glad you were able to acknowledge that in a public forum. Really, the *only* rule I take a different tack on (and I think we’ve discussed these guidelines between us on upwards of a dozen roadtrips) is Rule #3, about lining up relative to your projected pace — I’ve come to accept that there will always, ALWAYS be walkers lined up at the front of the queue, and so I usually line up between 30-60 seconds faster than my projected per-mile pace, and I just make sure to stay off to the side. Usually, I’m still passing people for the first mile or so, anyway. Oh, and that Total Recall reference was money. I’m pretty sure I break most of these rules except #3. That’s basic and everyone everywhere should follow it. Also – props for the Total Recall reference. That’s my favorite thing since Gorge Romero.